Built in Asker, Norway for the explorer Roald Amundsen, the Maud was christened by the explorer himself in 1916. Named for the Queen of Norway of the time, the ship was intended to take Amundsen on his second successful trip through the Arctic. And while she succeeded, traversing the Northwest Passage in six years, she arrived in Alaska haunted by debt. The ship was sold to cover her expenses, and the Hudson's Bay Company took possession in 1925. Renamed the Baymaud, she was outfitted for cargo transit across the Arctic. Her career with HBC would be short-lived though, as she became completely stuck in the ice of Cambridge Bay in the winter of 1926. Abandoned by her owners and crew, the ship stayed in her icy tomb until 1930, when most of her structure sank. The Maud, in Cambridge Bay. 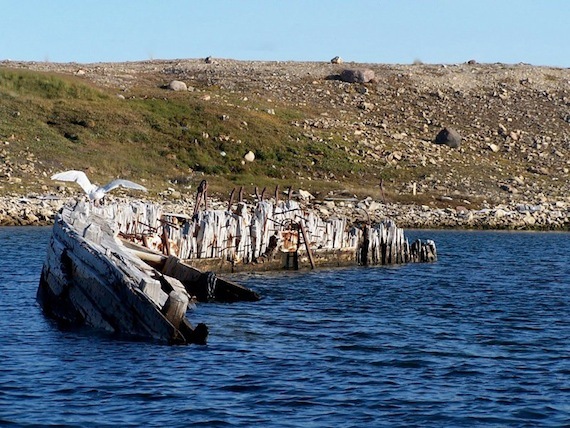 She's remained visible since then, and in 1990 her hometown, Asker, purchased the wreck from the Canadian Government. The intent behind the purchase was to refloat the wreck and return her to Norway. A Cultural Properties Export permit was filed with the Canadian Government, and approved quickly. But, as is usually the case with these sorts of things, it came down to dollars and cents. The price tag for repairs and refloating the wreck came to a whopping $43,200,000. The Cultural Export Permit expired, and the Maud remained in the icy clutches of Cambridge Bay. Then, in 2011, another application was put forward from Norway to salvage the wreck. While the government initially turned it down (with support of numerous Government groups and members of the community itself), the permit was granted in 2012. That November, archaeologists set up a camera to film what they hoped would be the Maud's last winter in Cambridge Bay. This year, they started work salvaging the wreck. While she has been in the bay for over almost 100, the team maintains that the oak wood has been kept in prime condition and that getting her onto a barge and back to Norway is completely possible. So what do you do with a ship that was once a sea-explorer and now is a shell of her former self? The plan, as it stands right now, is to make the Maud a centrepiece of a new museum, showcasing Asker's shipbuilding and marine history as a whole. The wreck, hopefully, should be on her way home in 2015, though there are many more hurdles to tackle before then - including her making it through yet another icy Canadian winter. If she does that, she'll be raised and sailed to Greenland, where she'll pass winter 2015 in the capital of Nuuk. Then, it's back to Norway, where hopefully she will be home in time for her 100th birthday. Images this week are from Nunatsiaqu Online.